May 2015 ENSO Forecast: Will this El Niño be an overachiever, or peaked-in-high-school? There’s a 90% chance that the current El Niño will continue through the summer, and forecasters estimate the chance that it will continue through the end of 2015 at greater than 80%. This is a pretty confident forecast. What are the forecasters looking at that gives them such confidence? Sea surface temperatures in the equatorial Pacific remained substantially above average during April. 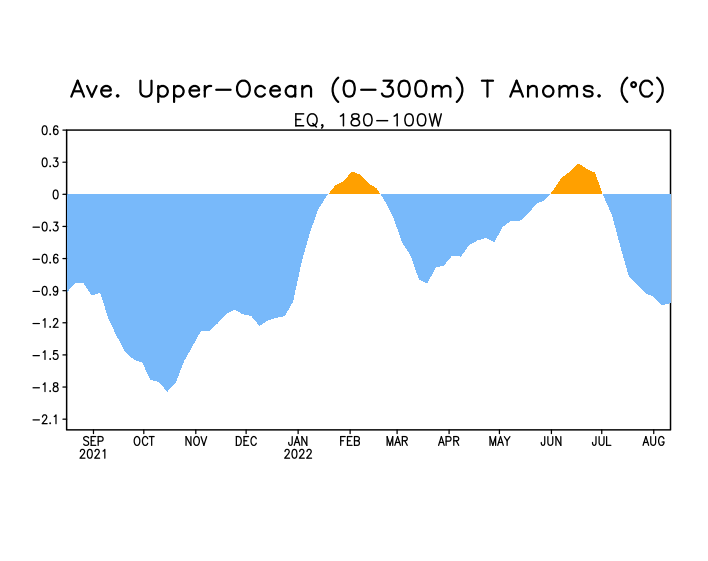 Also, there is still a lot of warmer-than-average water below the surface in the upper 300 meters of the ocean, helping to ensure that the above-average sea surface temperatures will continue for at least the next few months. Sea surface temperature departures from average in degrees Celsius during the week of May 6, 2015. Figure from CPC. The atmospheric response to the warmer waters in the equatorial Pacific that we began to see in February strengthened through March and April: the Trade winds are more westerly than average, upper-level winds are weaker than average, and more rain was present in the central equatorial Pacific. These are all signs of the weakened Walker Circulation, present during El Niño events, and act to reinforce El Niño events. Conditions look good, but what’s behind that confident forecast? Nearly all computer model forecasts predict a continuation of the warmer-than-average sea surface temperatures in the Niño3.4 region through the end of 2015. There is a lot of agreement among the models that the SSTs will remain warm, and most models are forecasting SSTs more than 0.5°C above average through the October-December period. This agreement in forecasts, in combination with an ongoing consistent atmospheric response, is a large contributor to the high probability that this El Niño will continue through the fall. Probabilistic sea surface temperature forecast from the North American Multi-Model Ensemble, made early May 2015, for the October-November-December 2015 average. Forecast is expressed as percent likelihood for each of three categories: Above normal, below normal, and near normal. Figure from CPC. As far as how strong this El Niño will ultimately be, it’s difficult to say. There is a fair amount of variation in the forecasts for the Niño3.4 region. The statistical models, which predict how current conditions are likely to change by applying statistics to historical conditions, are generally on the lower side of the forecast envelope, around 0.5°C – 1°C, the range of a “weak” event. As Michelle discussed in her last post, models – both dynamical and statistical – tend to have a harder time making successful forecasts during the spring as well. Also, El Niño events typically peak in the early winter, which is still six months away. These factors combine to make it difficult to predict the peak strength of this El Niño. It’s likely that we’ll have a clearer picture of the potential strength in the next month or so. For reference, the potential strength of the strong 1997-1998 El Niño didn’t become apparent, and wasn’t formally mentioned by CPC, until July of 1997 (Barnston et al. 1999). Speaking of typical events, though – this is not one of them. As you can see below, it is unusual for sea surface temperatures in the Niño3.4 region to start off warm in the winter and then continue to be warm through the spring and summer. In the 60-year record, only one El Niño event, in 1986-1987, had similar behavior. The evolution and strength of this event might be a little easier to predict if it were starting at a more typical time of year. Sixteen El Nino events, 1952 - present, with 2014-2015 in red. Average is shown in black. 1997-98 and 1986-87 are yellow and blue, respectively. Figure by Climate.gov from CPC data. OK, but what’s going to happen?? The Australian Bureau of Meteorology has just raised their event tracker to “El Niño” status, the equivalent of issuing an El Niño Advisory for us. (They have slightly different thresholds for declaring the onset of El Niño.) El Niño events are linked to increased drought and heat waves in Australia, especially during their winter (our summer), so they monitor its evolution closely. If you’re interested in the Australian perspective on ENSO, check out this great post authored by Andrew Watkins of the BOM. Also, since it’s very likely that this event will continue through the summer, we may see some effects on the tropical cyclone seasons. The western Pacific tropical cyclone season is off to a roaring start, with seven named storms so far (the average is two! ), which is likely linked to the warm Pacific waters. Keep your eye out for the NOAA hurricane forecast (issued this year on May 27) for potential effects of an ongoing El Niño. Barnston, A. G., M. H. Glantz, and Y. He, 1999: Predictive skill of statistical and dynamical climate models in SST forecasts during the 1997/98 El Nino episode and the 1998 La Nina onset. Bull. Amer. Meteor. Soc., 80, 217-243. *This is based on the Root-Mean-Square Error (RMSE), calculated from 32 years of past forecasts made in early May for the October-December average from the North American Multi-Model Ensemble. California could sure benefit with an El Nino winter as this usually provides them with an above annual rainfall average. Yes, and we will need it bad because of the drought. ya never know what el nino is gonna do...HOLD ON CUZ WE MIGHT BE IN FOR A RIDE! Does this mean there is a greater chance of tropical weather from Mexico moving north towards AZ and then northwest over the Sierras in the summer? Seems like we been getting more and more summer rain events on the west slope of the Sierras over the past few years. Is this a pattern we can expect to increase. It's actually nice to get summer thunderstorms once in awhile. I've developed an interest in meteorology due to my obsession with winter sports. The last two winters in Oregon have left me with plenty of time to read. This blog along with a few others have been enormously helpful in increasing my understanding of how our atmosphere behaves. This was a particularly good post. Thanks! I would love to see an email notification or RSS feed for updates on El Nino. I live in Bend Oregon and travel the west coast frequently. I was aware of and studying the drought long before the news media picked up on it. I'd love to be able to follow the current El Nino data via notifications. http://www.cpc.ncep.noaa.gov/products/analysis_monitoring/enso_advisory/... is updated the morning of the 2nd Thursday of each month. http://iri.columbia.edu/our-expertise/climate/forecasts/enso/current/?en... is updated at same time as the above site, and also on the 3rd Thursday of the month (most often in the afternoon). The second site above has branches into various other aspects of El Nino and La Nina, some giving meaty technical information, which I don't know would please you or turn you off. In the graphic "2014-2015 compared to past el niños" there is what I modestly believe is a crazy fingers typo error. At the end of the temporal scale, the sequence goes ASO, SON, OND... and one expects to find NDJ, not NJD, please. Frightening article on the other hand. Lets brace the best we can fellow humans. And please excuse my poor english as I am not native to the language. We apologize for using "NJD" instead of "NDJ" in the graphic. Good eye! I hope you got the general idea of the piece despite that error. how is the 90% chance derived? Great post. This question came up in a discussion today - how is the 90% chance derived that the El Nino will continue this summer? Is it based strictly on probabilities derived from the IRI forecast plume (e.g., 90% of the models agree). Are is there some subjectivity involved based on expert opinion? BTW, using expert opinion to adjust the probabilities is not necessarily a bad thing, IMO. I wasn't sure. Thanks. RE: how is the 90% chance derived? Very good question. It is not based just on the IRI/CPC forecast plume. There are 11 human forecasters involved in the development of the probabilities. These forecasters inspect the plume, but also look at a large set of other inputs, some of which are current observations and their recent trends, and some of which are details of the forecasts of some of the models on the plume. These details include, for example, the spread of the model's ensemble members, which is related to the predictive uncertainty. The plume shows the mean forecasts of each model, but does not show the spread of the individual dynamical models' forecasts. Human judgement and experience also comes into play in each forecaster's vote on the probabilities. It is an interesting issue whether this human element improves the value of the forecasts, or if the set of the models' objective forecasts would be just as good, or even better. Some of the 11 forecasters have been around for decades and have a ton of experience with ENSO, while others are earlier in their career. Each person undoubtedly weights things a bit differently, and it is hoped that 11 forecasters is enough for some of these biases to offset one another. The probabilities based on the plume alone can be found in one of the graphs on an IRI web site: http://iri.columbia.edu/our-expertise/climate/forecasts/enso/current/ The plume-based probabilities are formed not just by counting the proportion of models forecasting each category (La Nina, neutral, El Nino), but are based on the average numerical forecast among all models, combined with an uncertainty distribution (Gaussian) derived from an estimate of the historical skill of the set of models over a a 30 or greater year period. CPC updates the equatorial SOI on a monthly basis. The April value was updated around May 5th, and the May value will be updated around June 5th. Dear Emily, thanks for this clear explanation of the current state of the 2015 ENSO. Does your group (or any other that you are aware of which does similar work) gauge how much the ENSO affects the Indian summer monsoon? I work on agriculture and having a good understanding of all the climatological factors that influence our monsoon is vital. We're seeing right now an Arabian Sea that is warmer than it should be, and large areas in the Bay of Bengal that are cooler than they should be. Just as Australia monitors the strength of an ENSO to prepare for drought, we must do the same to prepare for increased dryness and, more important, delayed sowing. Can someone tell me if there is any correlation between the strength of an el nino event and the SST anomalies found off of the Labrador Straights and Newfoundland. I am wondering if the stronger el nino event occur when the SST anomalies off of Labrador is significantly colder than normal? 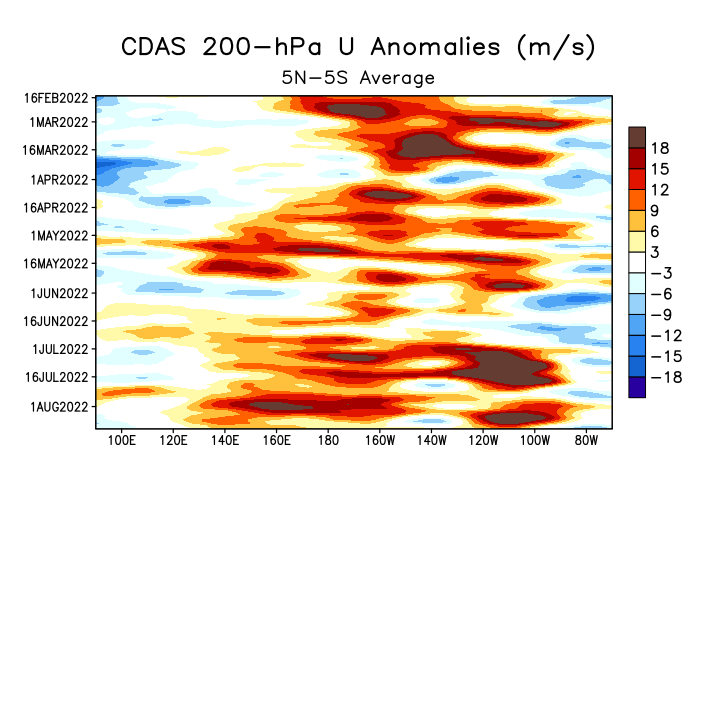 I"m not aware of any relationship between North Atlantic SST anomalies and the strength of El Nino. 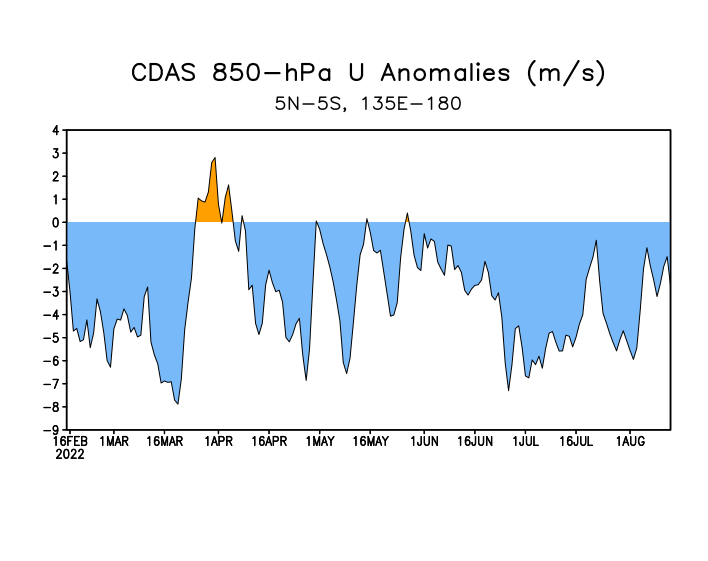 I'd think that the North Atlantic anomalies are more directly related to the North Atlantic Oscillation (NAO) or the Atlantic Meridional Oscillation (AMO). Your commentary is a great source of background analysis. I'm interested in the summer weather mostly in the extreme El Nino years of 1982 and 1997. My limited research see's summer temperatures and regional precip can be unique to each El Nino. Where can you point me to read up on how summer weather played out across the US in those 2 years? Much thanks for your comments. The Climate Assessment for 1997, available on the Climate Prediction Center web site, might have some of the information that you're seeking. Both events had similar peaks in terms of timing & intensity, peaking just above the strong NINO threshold (1.5C (although 1987-88 was still a moderate NINO by Jan Null's 3 successive tri-monthly definition) in the late summer-early fall w/ 1905-06's peak ONI of +1.69C in JAS & 1987-88's +1.57C in ASO. I think this is a reasonable solution to anticipate for now, however only time will tell. Strong ENSOs have been associated with more rainfall in the Galapagos Islands. Is that likely with this event? And for timing of a trip there, is there likely to be much difference in rainfall between November and December this year? Checking your perspectives and actual temperature conditions, Pacific Coasts of Colombia,Ecuador and Northern Peru will suffer of a tremendous effects of a Big " El Niño ", by the last months of 2015 and initial ones of 2016. In all the prior Niño events described in the comparative charts, not one of them have shown an anomaly of almost 3.5/4.0 + C as the actual temp. may/jun 2015 and checking the chart of probabilities that indicates + 90 % to occur the continuation of the high temp. in this areas, the conclusion can be that we will have in this area a very intense phenomenon, even greater than the last ones of 1983 and 1997. Peru suffered in those events of 1983 and 1997 tremendous and devastating effects, with many deaths, injured, destruction of roads, irrigation systems, houses,etc., not seen since the BIG El Niño in 1927 that destroyed entire cities. Is there any possiibilty that you as Organization alert Peruvian Authorities of the Risk of a Mayor Event ? ?